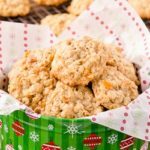 Amaretto Apricot Oatmeal Cookies are loaded with apricots and almonds. It's a fruity, nutty, and delightful treat with the goodness of oats. Preheat oven to 350°F. Line baking sheets with parchment paper or non-stick liner. Beat butter, brown sugar, and granulated sugar in a large bowl until light and fluffy. Add eggs and amaretto and beat well. Whisk together flour, baking soda, and salt. Add to creamed mixture and beat until just combined. Drop by rounded tablespoonfuls 2 inches apart on baking sheets. Bake for 12 minutes, or until light golden brown. You can substitute 1/2 teaspoon almond extract plus 2 teaspoons water for the amaretto if desired.